LAKEWOOD, NJ - The BlueClaws welcome the Phillie Phanatic to FirstEnergy Park on Thursday, June 19th, and at the game, they will hold their annual Troop Supply and Care Package Drive. The Phanatic, the world's most famous mascot, makes the first of two trips to the ballpark this summer and between innings, he will entertain fans like only he can. 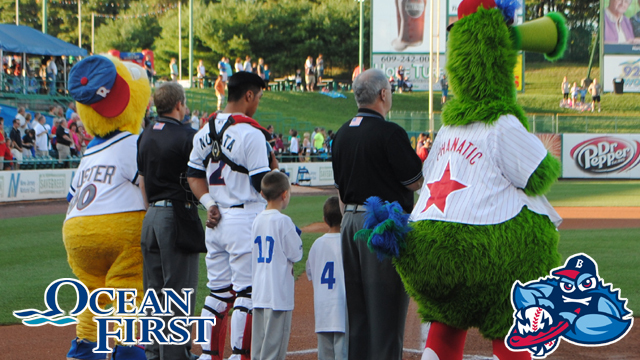 The Phanatic's appearance is presented by OceanFirst Bank. Tickets - For tickets, call 732-901-7000 option 2 or click here. Boxes will be set up for the Troop Supply and Care Package Drive in the front of the ballpark and fans are encouraged to donate razors, snacks, baby wipes, shampoo, soap, non-chocolate candies and sweets, sun block with SPF 40+, lip balm, writing utensils, silly string, deodorant, tissues, q-tips, white socks, batteries, insect repellent, and flashlights. The BlueClaws will also be collecting, as always, gently used cell phones at the NJNG Information Booth to benefit Cell Phones for Soldiers. This supply and care package drive is in conjunction with the Monmouth-Ocean Central Labor Council Military Committee, Monmouth-Ocean Building Trade Council, National Guard, Toms River Armory, A.R.M.S, and IBEW Local 400 Military Committee. "Military Appreciation Night here in Lakewood has been a great event these last nine years," said Pat O'Keefe of the IBEW Local 400 Military Committee. "It's great to see the local community come out and support the event and our Troops overseas." The Troop Supply and Care Package Drive takes place on Military Appreciation Night, where military groups will take in the game and there will be various pre-game ceremonies honoring military members. For more in Military Appreciation Night, call Jim McNamara at 732-901-7000 ext 176. Thirsty Thursday - This is also a 66MVP Thirsty Thursday, with dollar beer and soda plus 50-cent wings in the Coors Light WRAT Trap.